Definition at line 25 of file Config.h. Definition at line 32 of file Config.h. Definition at line 33 of file Config.h. Definition at line 293 of file ServiceConfig.cc. References cfg_filename, config_lineno, DBG_CRITICAL, debugs, and HERE(). Definition at line 51 of file Config.cc. Definition at line 310 of file ServiceConfig.cc. References cfg_filename, config_lineno, DBG_CRITICAL, debugs, NULL, and p.
Definition at line 325 of file ServiceConfig.cc. References cfg_filename, config_lineno, DBG_CRITICAL, debugs, Adaptation::srvBlock, Adaptation::srvBypass, Adaptation::srvForce, and Adaptation::srvWait. Definition at line 189 of file ServiceConfig.cc. References SBuf::assign(), cfg_filename, config_lineno, DBG_CRITICAL, debugs, String::find(), HERE(), Adaptation::ServiceConfig::host, SBuf::isEmpty(), len, String::limitInit(), String::npos, NULL, p, Adaptation::ServiceConfig::port, Adaptation::ServiceConfig::protocol, String::rawBuf(), Adaptation::ServiceConfig::resource, Adaptation::ServiceConfig::secure, String::size(), Security::PeerOptions::sslDomain, String::substr(), String::termedBuf(), and Adaptation::ServiceConfig::uri. Definition at line 26 of file ServiceConfig.cc. Referenced by Adaptation::Config::dumpService(), Adaptation::Icap::ModXact::makeRequestHeaders(), and Adaptation::ServiceConfig::parse(). Definition at line 68 of file ServiceConfig.cc. References Adaptation::ServiceConfig::bypass, cfg_filename, config_lineno, YesNoNone::configure(), Adaptation::ServiceConfig::connectionEncryption, DBG_CRITICAL, DBG_IMPORTANT, DBG_PARSE_NOTE, debugs, Ip::EnableIpv6, encrypt(), Security::PeerOptions::encryptTransport, Adaptation::ServiceConfig::grokBool(), Adaptation::ServiceConfig::grokExtension(), Adaptation::ServiceConfig::grokLong(), Adaptation::ServiceConfig::grokOnOverload(), Adaptation::ServiceConfig::grokUri(), Adaptation::ServiceConfig::ipv6, Adaptation::ServiceConfig::key, Adaptation::ServiceConfig::maxConn, Adaptation::ServiceConfig::method, Adaptation::methodNone, Adaptation::ServiceConfig::methodStr(), ConfigParser::NextToken(), Adaptation::ServiceConfig::onOverload, Security::PeerOptions::parse(), Adaptation::ServiceConfig::parseMethod(), Adaptation::ServiceConfig::parseVectPoint(), Adaptation::ServiceConfig::point, Adaptation::pointNone, Adaptation::ServiceConfig::routing, Adaptation::ServiceConfig::secure, String::size(), Adaptation::srvBypass, Adaptation::srvWait, String::termedBuf(), Adaptation::ServiceConfig::uri, and Adaptation::ServiceConfig::vectPointStr(). Definition at line 38 of file ServiceConfig.cc. References Adaptation::methodNone, Adaptation::methodReqmod, and Adaptation::methodRespmod. Definition at line 50 of file ServiceConfig.cc. References Adaptation::pointNone, Adaptation::pointPostCache, and Adaptation::pointPreCache. Definition at line 32 of file ServiceConfig.cc. Referenced by Adaptation::Config::dumpService(), and Adaptation::ServiceConfig::parse(). Definition at line 44 of file ServiceConfig.h. Referenced by Adaptation::Icap::ServiceRep::announceStatusChange(), Adaptation::Config::dumpService(), Adaptation::Ecap::ServiceRep::handleFinalizeFailure(), Adaptation::Ecap::ConfigRep::option(), Adaptation::ServiceConfig::parse(), Adaptation::Icap::ModXact::start(), and Adaptation::Ecap::ConfigRep::visitEachOption(). Definition at line 54 of file ServiceConfig.h. Referenced by Adaptation::Config::dumpService(), Adaptation::Ecap::ServiceRep::finalize(), Adaptation::Icap::ServiceRep::finalize(), Adaptation::ServiceConfig::parse(), and Adaptation::Ecap::XactionRep::updateSources(). Definition at line 34 of file Config.h. Referenced by Adaptation::Ecap::ConfigRep::option(), and Adaptation::Ecap::ConfigRep::visitEachOption(). Definition at line 38 of file ServiceConfig.h. Referenced by Adaptation::Icap::Xaction::dnsLookupDone(), Adaptation::Icap::Xaction::finalizeLogInfo(), Adaptation::ServiceConfig::grokUri(), Adaptation::Icap::OptXact::makeRequest(), Adaptation::Icap::ModXact::makeRequestHeaders(), and Adaptation::Icap::Xaction::openConnection(). Definition at line 50 of file ServiceConfig.h. Definition at line 33 of file ServiceConfig.h. Referenced by Adaptation::Config::dumpService(), Adaptation::Icap::Xaction::finalizeLogInfo(), and Adaptation::ServiceConfig::parse(). Definition at line 47 of file ServiceConfig.h. Referenced by Adaptation::ServiceConfig::parse(), and Adaptation::Icap::ServiceRep::setMaxConnections(). Definition at line 42 of file ServiceConfig.h. 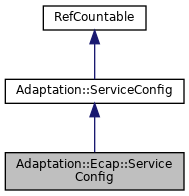 Referenced by Adaptation::Icap::ServiceRep::checkOptions(), Adaptation::Icap::ModXact::finalizeLogInfo(), Adaptation::Icap::ModXact::makeRequestHeaders(), Adaptation::ServiceConfig::methodStr(), Adaptation::ServiceConfig::parse(), and Adaptation::Icap::ModXact::validate200Ok(). Definition at line 48 of file ServiceConfig.h. Referenced by Adaptation::Icap::ServiceRep::availableConnections(), and Adaptation::ServiceConfig::parse(). Definition at line 43 of file ServiceConfig.h. Referenced by Adaptation::ServiceConfig::parse(), and Adaptation::ServiceConfig::vectPointStr(). Definition at line 40 of file ServiceConfig.h. Referenced by Adaptation::Icap::Xaction::dnsLookupDone(), Adaptation::Icap::ServiceRep::finalize(), Adaptation::ServiceConfig::grokUri(), Adaptation::Icap::OptXact::makeRequest(), Adaptation::Icap::ModXact::makeRequestHeaders(), and Adaptation::Icap::Xaction::openConnection(). Definition at line 37 of file ServiceConfig.h. Referenced by Adaptation::Config::dumpService(), Adaptation::Icap::ServiceRep::finalize(), and Adaptation::ServiceConfig::grokUri(). Definition at line 39 of file ServiceConfig.h. Definition at line 49 of file ServiceConfig.h. Referenced by Adaptation::ServiceConfig::parse(), and Adaptation::Ecap::XactionRep::updateHistory(). Definition at line 53 of file ServiceConfig.h. Referenced by Adaptation::Config::dumpService(), Adaptation::Icap::ServiceRep::finalize(), Adaptation::ServiceConfig::grokUri(), and Adaptation::ServiceConfig::parse(). Definition at line 34 of file ServiceConfig.h. Referenced by Adaptation::Config::dumpService(), Adaptation::Icap::Xaction::finalizeLogInfo(), Adaptation::ServiceConfig::grokUri(), Adaptation::Icap::OptXact::makeRequest(), Adaptation::Icap::ModXact::makeRequestHeaders(), and Adaptation::ServiceConfig::parse().